On Monday night I was part of a small group that was treated to a private tour of the Elizabeth Taylor collection (jewelry, clothing, doo-dads) being auctioned off by Christie’s. The sale itself kicked-off the following night with some of Taylor’s most famous baubles (among them the Elizabeth Taylor diamond, formerly known as the Krupp) and while I wasn’t surprised to hear that many of these pieces brought record prices (the sale netted over $137 million), staring at them in their impersonal Plexiglass encasements was a lot less jaw-dropping than I imagined it would be. Taylor obviously fell in love with bling decades before the word moved into common usage, but it’s only when you stand in front of many of these pieces that you realize just how super-sized and ornate many of them really are — I mean, much of the stuff is huge . . . and really kind of tacky! The fact that a woman who stood just over five feet tall could pull them off the way she did is a tribute to whatever it is that made Taylor, Taylor (insert your own Taylor cliché here). And in the end, I guess that’s what was missing for me when I walked through the exhibition. Without Taylor’s presence to bring them to life, they were just big stones in elaborate settings. Still, you can’t help but respect the gusto with which she reveled in the things she loved, or the energy she brought to the things she believed in. There was nothing prissy about E.T., no effort to appear more delicate or refined than she really was. Big, lusty, joyful all apply here. And while it may seem like a bit of a stretch, I find the same qualities hold true for the sort of cooking and flavors I’m drawn to. This week’s recipe is a good example. It’s about as subtle as the enormous diamond and ruby necklace Mike Todd presented to Taylor in 1957 (which is to say, not at all), and depending on your appetites, even more satisfying. I don’t know how Elizabeth Taylor felt about Italian-American cooking, but it’s not hard to imagine her digging into a plate of these braised beef roles (a.k.a. braciole) with something of her signature enthusiasm and abandon. The recipe comes from Lidia Bastianich’s new collection, Lidia’s Italy in America. The book was released a month or so ago and features many of those recipes we know from classic red-sauce establishments in the U.S. — dishes like chicken Parmesan, sausage and peppers, and the seafood soup known as Cioppino. I love this kind of food. It’s less refined and subtle than the cooking one might find at even the simplest little trattoria in Italy, but it’s bold, and lusty, and compulsively eatable. It’s the sort of food I ate as a kid at restaurants like Villa di Roma in South Philadelphia, where it was impossible to order a bucket of muscles in garlicky red sauce without also consuming a loaf of soft Italian bread — because you couldn’t possibly let all that wonderful broth go to waste! 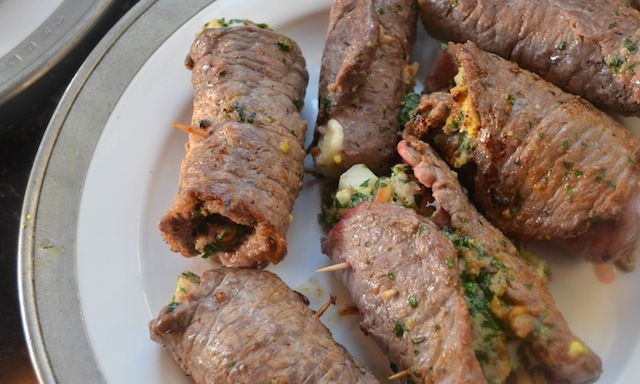 Braciole is a more recent discovery. 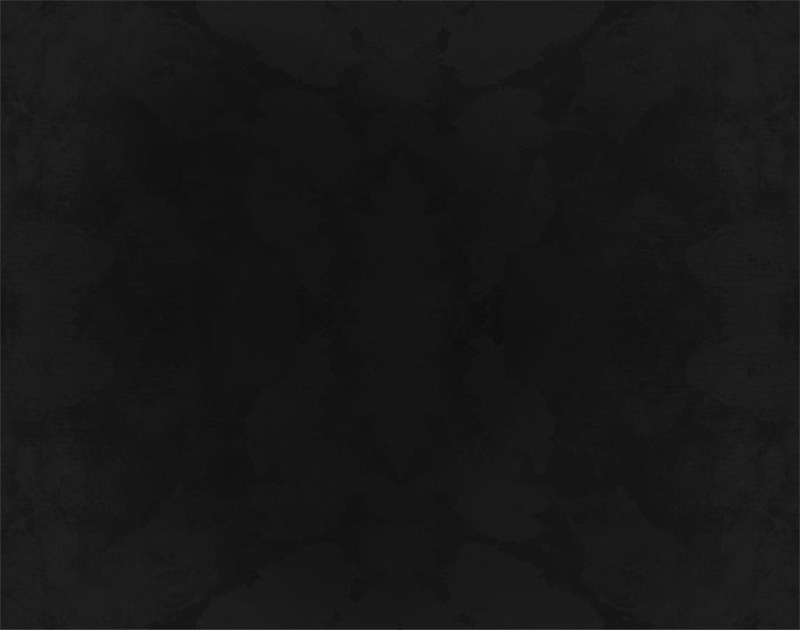 My friend Dennis first made it for us several years ago, and for me at least, there’s been no turning back. I’m not quite sure how it took me forty-plus years to become acquainted with the dish, but once I was it immediately moved into “favorite” status. For one thing it features the kind-of red sauce that some Italian Americans refer to as Sunday Gravy, and that others call Neapolitan Ragu, but which is essentially a thick marinara flavored with garlic and oregano and flecked with bits of meat — in other words, really good stuff! And then there’s the fact that the sauce accompanies thinly pounded beef, which contains a variety of enticing fillings, such as cheese (sometimes Parmesan, other times Provolone), pine nuts, hard cooked eggs, even prosciutto. I mean, how can you go wrong here? According to Bastianich the dish is a Sunday night staple in many Italian-American households, though other recipes I’ve come across have mentioned it in connection with the traditional Italian-American Christmas dinner, as well. Whichever the case, it seemed festive and celebratory in just the right way, not to mention a nice alternative during this season of fruit cake and roast goose. And it provided a good excuse for making the dish for my own Sunday night dinner recently! 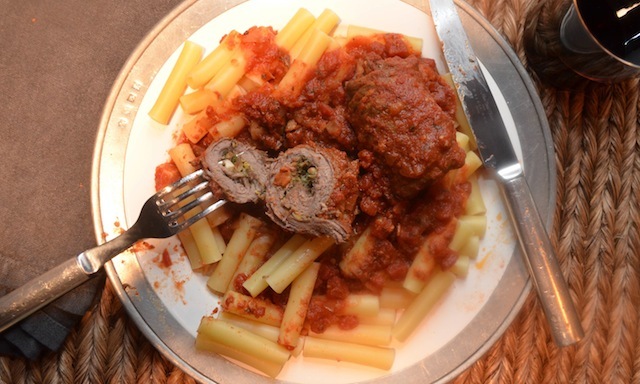 Bastianich suggests ladling the red sauce over rigatoni as a first course, separating out the braciole to serve next alongside some olive oil mashed potatoes and escarole sautéed in olive oil (recipes for both items are included in the book). Even by my over-indulgent standards that sounded more abundanza than I was looking for, so I simply cooked up some pasta and spooned a generous amount of gravy and several pieces of braciole over top. Admittedly the escarole would have been a good addition, though all in all I couldn’t have asked for a more satisfying way to end the weekend. Or, for that matter, to spend the better part of the afternoon. This needs to be said, since while the dish is certainly as easy to prepare as Bastianich claims, it is also a time consuming process (something she doesn’t mention), requiring several hours of prep, not including the hour and a half in which the meat and sauce are left to simmer gently on the stove. This is to be expected anytime a recipe calls for pounding a large number of beef slices to a fraction of their existing thickness, and when there’s a lot of browning of meat involved. Still, the various steps involved don’t require any particular expertise or culinary know-how. 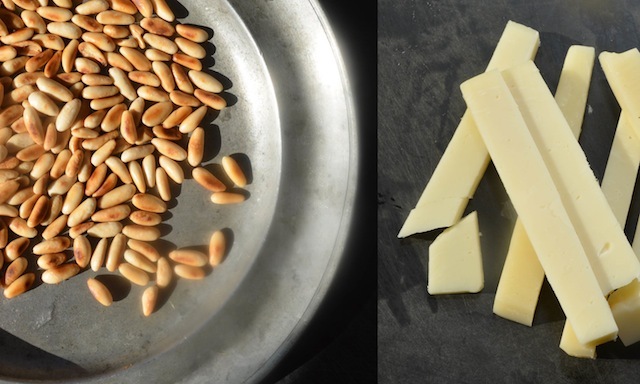 There’s the making of the filling, which includes stale bread-cubes soaked in milk (and squeezed dry), that are then mixed with toasted pine nuts (directions below, as these are not included in Bastianich’s recipe), some olive oil, and a quantity of chopped Italian parsley and hard cooked eggs. This is then spread across one side of the beef, topped with a long chunk of provolone cheese (not grated as with other braciole recipes I’ve come across), rolled up, and held closed with a toothpick. I did find Bastianich’s instructions regarding this last step a bit confusing, so note that when she says to roll the meat lengthwise, she means for you to lift one of the two longer sides of the beef and to roll it towards the opposite side (in other words, the exact opposite of what I did in the attached images). This will produce a braciole that looks more like a cigar than the sausage-shaped creation I ended up with. Once browned all-over (roughly three minutes per side) the meat is set aside and you’re ready to prepare the sauce. This involves a quick sauté of the chopped onion, then the garlic, at which point a cup of dry white wine is added to the pot. 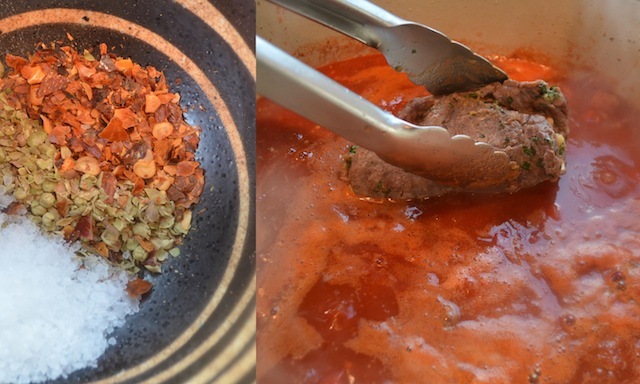 When the wine is nearly evaporated, in go the crushed tomatoes, along with two cups or water, as well as a variety of seasonings (oregano, salt, hot pepper flakes). Return to a boil, add the meat to the sauce, and after an hour and a half at a low simmer the braciole will be fork-tender and ready to eat. 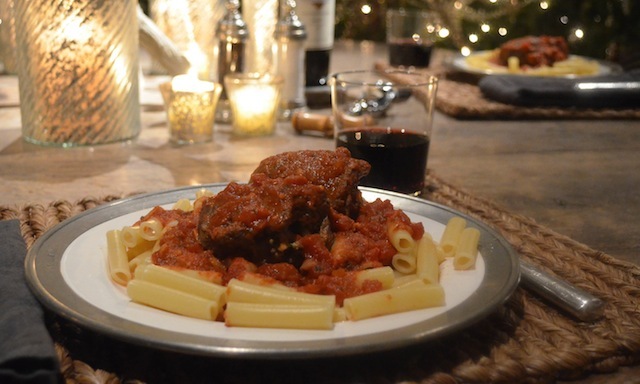 Since there were only two of us sitting down to dinner I was able to enjoy the braciole over a series of meals — ample opportunity to marvel at the tangy, garlicky pleasures of the meat-infused sauce, and the way the cheese remained intact within its meat sheathing and imbued each bite with a pleasant hit of salt. Together with the herbs, the egg, and the pine nuts, I found the filling pretty wonderful, though other recipes I’ve come across call for raisins, chopped figs, even cooked sausage or a slice of prosciutto — food for thought, if nothing else. (And I keep wondering what the addition of a tablespoon or two of capers might do the mix of flavors). The main thing is to feel free to play around and make it your own, whatever the occasion. That’s the beauty of the melting pot. —Pour the milk over the bread cubes in a bowl and let soak while you slice the beef. 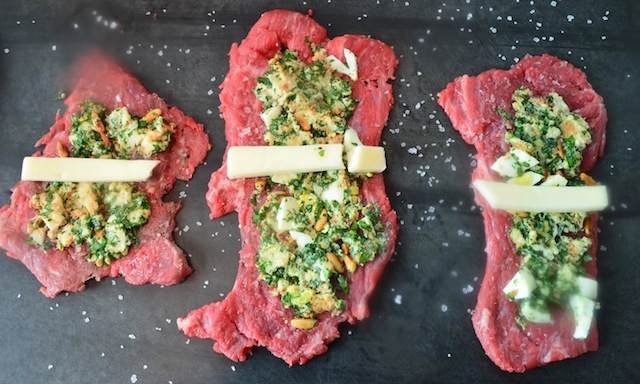 —Slice the beef into 2 to 3 oz slices (ideally you want 12 pieces). Pound the slices all over with a mallet to about 1/4 to 1/8 inch thick. Don’t worry if slices tear — you can patch as needed by over-lapping the torn sections. Set aside. 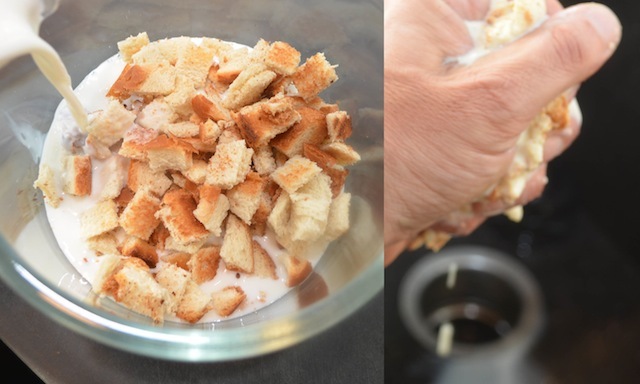 —Squeeze the excess milk from the bread and place in a large bowl. 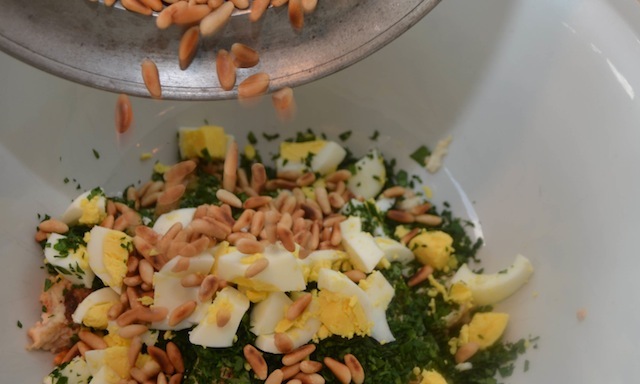 Add the parsley, eggs, pine nuts, 1 tbs olive oil, and 1 tsp salt. Season with pepper and mix. 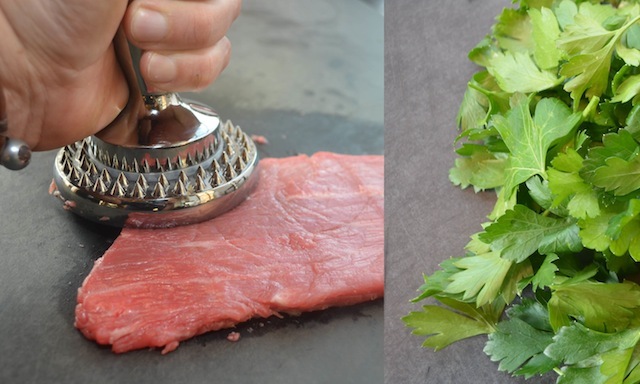 —Lay the pounded beef slices flat on your work surface and season with salt. Evenly divide the filling among the slices, approximately 2 to 3 tbs for each slice, then spread within 1 inch of the edge on all slices. Place a piece of cheese crosswise in the center of each slice. Roll the slices lengthwise and pin the rolls closed with toothpicks, pinching the meat to ensure each roll is tight. —Heat the remaining oil in a large Dutch oven over medium heat. Season the braciole with salt and add to the pot to brown on all side, about 2 to 3 minutes per side, in batches if necessary (you may need to trim toothpicks with scissors to facilitate browning). Remove the browned braciole to a plate and toss the onion into the pot. Cook until the onion is softened, about 4 to 5 minutes, then add the garlic. Cook a minute or two until the garlic is sizzling, then pour the white wine into the pot. Increase heat, bring to a boil, and cook until the wine is almost evaporated, about 4 to 5 minutes. Pour in the tomatoes. Slosh out each can with one cup of hot water and add to the pot. Season with the oregano, the hot pepper flakes, and the remaining 2 tsp of salt. —Return the sauce to a boil, return the beef rolls to the pot, and adjust heat to maintain a steady simmer. Cover and cook until the braciole are very tender, 1¼ to 1½ hours. If the sauce is too thin, remove the braciole to a plate and reduce the sauce over high heat until it thicken to a gravy consistency. 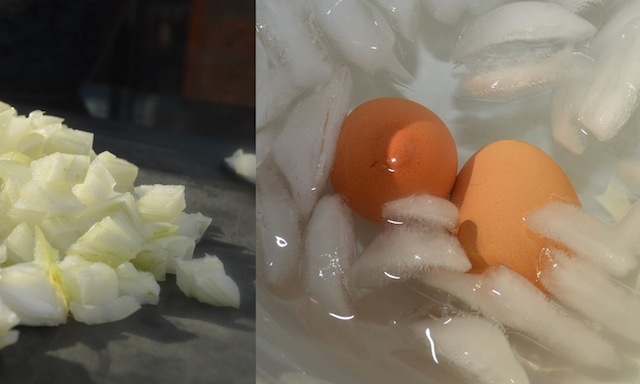 —Place 6 eggs in a single layer in a medium saucepan, cover with 1 inch of water, and bring to a boil over high heat. Remove pan from heat, cover, and let sit 10 minutes. Meanwhile, fill a medium bowl with 1 quart water and 12 ice cubes. Transfer eggs to ice water with a slotted spoon; let sit 5 minutes. Peel and use as desired. —Place pine nuts in a dry skillet over medium-low heat. Shake the skillet frequently to ensure even browning (pine nuts are full of oil and will burn quickly if not watched carefully). When the nuts are fragrant and browned, take the pan off the heat. Transfer the pine nuts to a plate to cool. Looks good.Will have to get Anne to make it. loving this Brad, thank you!